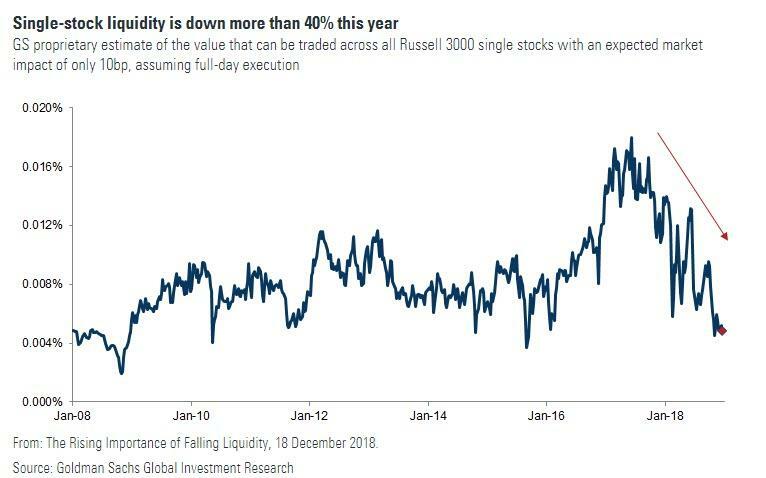 With stocks resuming their plunge, an old market bogeyman has emerged - the same one which Bill Blain said earlier scares him the most, namely the lack of liquidity. 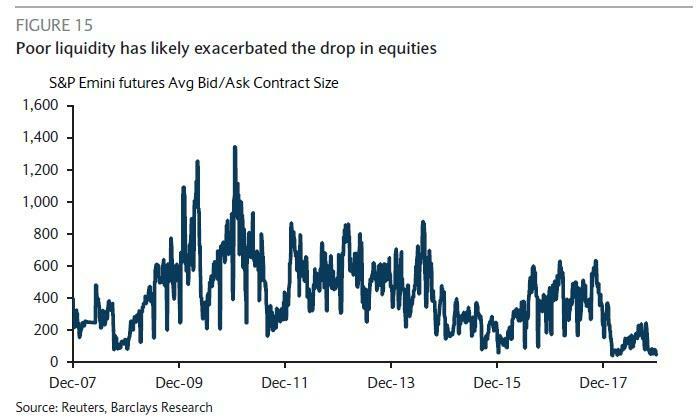 And unfortunately, in a perverse feedback loop, the more equities drop, the worse the overall S&P liquidity, as the following chart from Barclays show, depicting the collapsing bid/ask size in the Emini, which is now do to the lowest on record. But wait there's more: ever feel like the smallest order gets to push the Emini around like a toy? 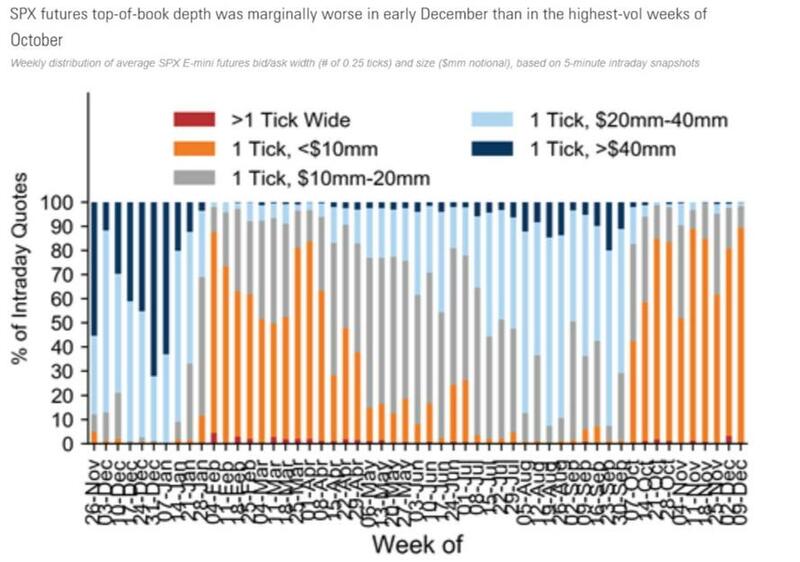 It's not just a feeling: it's the truth, because as shown below, not only is the Emini futures top-of-book depth worse now than it was in the highest-vol weeks of October, it is also worse than it was during the record VIX surge in February. In fact, the top Emini orderbook has never been worse. 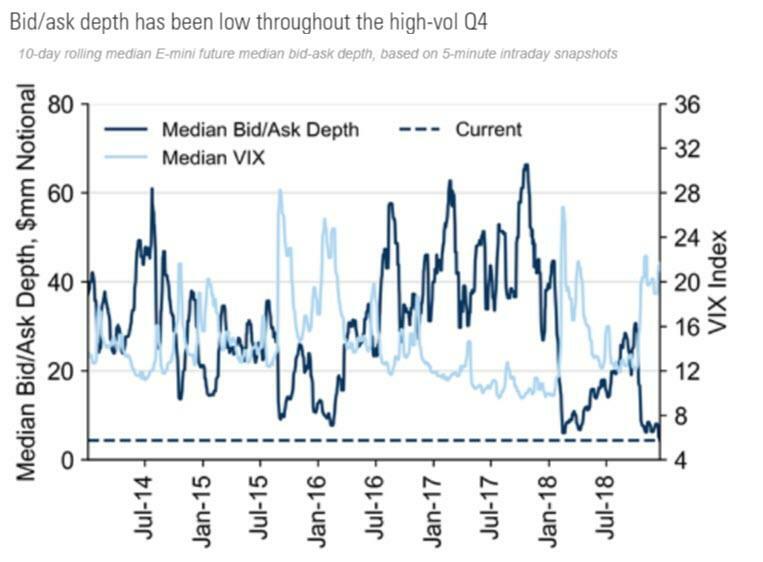 Finally, while overall S&P liquidity is at all time lows, single-stock liquidity has also declined meaningfully over the course of 2018, and as Goldman's chart of the week shows, single stock liquidity is now just shy of all time lows, and the recent trend - Goldman writes - has contributed to the increase in volatility this year. And, as the bank warns, going forward "it could also suggest a higher risk of short-term price dislocations." Like the one we are seeing today, for example.